Are Rammed Earth houses appropriate for indigenous Australian housing developments id dry Arid environments? Daniela Ciancio and Chris Beckett, from the School of Civil, Environmental and Mining Engineering at UWA are working on a project based in Kalgoorlie to assess the practicality of using rammed earth (RE) housing over steel framed houses. “When you are in the middle of nowhere and you want to build a house you have to transport the materials to the construction site, you have to send labor force to the site and you have to provide accommodation for the people,” Dr Ciancio says. 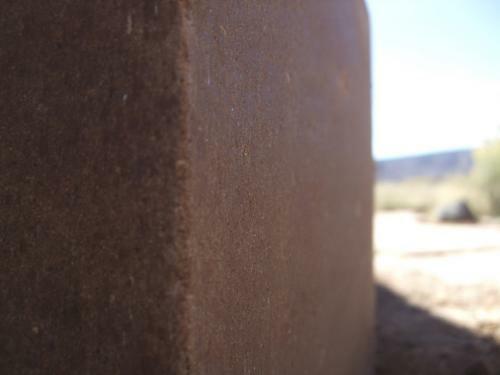 “If we use rammed earth then we can use the material available on site because it’s just earth. It saves a lot of costs,” she says. RE is raw soil mixed with water and compacted into formwork to create strong free-standing structures. To increase the stability of RE it can be mixed with LIME. “If the earth that you are using is very rich in clay, then you can add lime. Clay, lime and water when they’re mixed together—they react in a way that is very similar to the reaction of cement,” Dr Ciancio says. “It will work like glue binding together and making the materials stronger.” Dr Ciancio and fellow researchers have been conducting tests to determine the optimium lime content (OLC) needed to make RE more durable against the elements. “Too little amount means that you don’t get enough strength, too high amount and you get up to the maximum strength. You can keep adding lime but it won’t improve the materials,” she says. This will help investigate alternatives to the industry standard use of cement as the main stabiliser! RE uses thermal mass, removing the need for artificial heating and cooling. In places that are hot during the day and cool at night the RE will absorb and trap the heat from the sun, releasing it out again at night. Fellow researcher Dr Chris Beckett says once the houses in Kalgoorlie are complete, families will live in them to test how effective they are compared to other housing. “We know these houses will work better than the current transportable options. The material is cheaper, the maintenance costs post-construction will be lower because there will be fewer machines operating. For example they won’t need to use air conditioning all the time,” Dr Beckett says. Dr Ciancio hopes the research will encourage local communities to get involved with the building of their own home. A logical step would be to make formwork, a bobcat and training available for interested local communities! ← Your Home guide to Rammed Earth, Mud brick and Strawbale building.